1. Autumn Essie Polishes- Now the Halloween parties are starting to kick off it's well and truly time to put those brights and pastels to bed and bring out the muted tones and berry shades on the talons. It may come as a shock to most beauty bloggers that I currently only own one Essie nail polish (the much hyped 'fiji') so I'm keen to expand my autumnal collection with the likes of 'Bordeaux', 'Soul Mate' and 'Marino Cool' which are gorgeous Autumnal colours in a high quality long lasting and shiny formula. 2. Bleach London Super Cool Colour- Making your hair unnaturally brighter as the nights get darker is quite an unusual aw13 trend, but it's one that Bleach London's new 'Super Cool Colour' is making me totally determined to buy into! These crazy hair dyes are only £5 a bottle, last for up to eight washes and come in a range of wacky pastel and bright shades. As they work best on blonde hair I'm determined to have my little pony unicorn hair by the end of next pay day...watch this space. 3. MAC 'Let me Pop' Paint Pot- These past few weeks I've become a bit obsessed with copper eyeshadow. I just think it's super pretty and perfect for both day and night looks. For a while I've been wearing 'Chopper' from the Urban Decay Naked 2 palette but now it's actually Autumn I'm after something more pigmented and long lasting in the form of the MAC 'let me pop' paint pot which is the most gorgeous pinky true copper shade that I think will look stunning worn alone on the lid and under the waterline. 4. Soap & Glory 'Bright Here, Bright Now'- I don't know if it's just me but I always struggle to get glowing skin at this time of year- the post holiday tan is long gone and full time work is leaving me with tired eyes. Not a good look! I swear by Rimmel Wake me Up foundation to perk up the face but I also want something to make my skin glow without make up and I think the Soap and Glory 'Bright Here, Bright Now' would be perfect as it's not only moisturising and skin perfecting but really illuminating too. 5. Benefit 'Rockateur'- I defy anyone to be surrounded by Benefit make up all day at work and not be tempted by it! Latest on my lust list is the new Box o' Powder- Rockateur. I do struggle with Autumn blush because I'm obsessed with summery corals and peaches, but this is a beautiful pigmented rose gold colour that gives a snowy flushed look to the cheeks with a hint of party shimmer. I may have to get this in my life and on my cheeks asap, particularly as I'm heading on a night out in London with my home girls tomorrow! 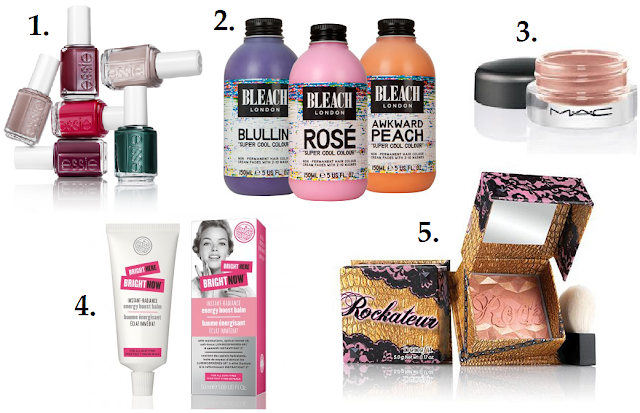 What's on your October Beauty Wishlist? Oh the bleach London look amazing! omg great wishlist, i really wanna try the bleach london products! The blush looks amazing also! Ooh my, you are going to look fab with all of those pretty colours in your hair. I use Bleach's Silver Conditioner which is lovely so if that's anything to go by, I'm sure their dyes will be lovely too. I'm quite tempted by Rose, I must admit and you lucky lady being a Benebabe! I was watching your video earlier, super jealous. I don't blame you for bing tempted, if I were in your shoes, I'd be like "just pay me in makeup, thankssss! "- Rockateur does look beautiful! I really want to try Mac paint pots and the Bleach London super cool colour. Such a great wish list lovely! For the skin try Origins Energy Boosting moisturiser! and exfoliation a few times a week helps my skin radiance too :) Hope this helps.